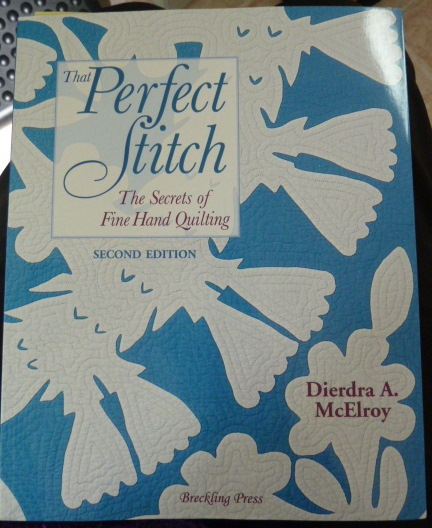 Today the postie brought my copy of the new edition of That Perfect Stitch by Dierdra A. McElroy. I’ve heard so much about this book that I was really interested to read it. The old edition when I searched for it was only available at exorbitant prices ($90+) so I waited for the new one. Now you can buy secondhand ones (presumably the old edition) for $4.00! I’ve only had a quick flip through it but it looks chock full of very useful information. Unfortunately I’ve given up the search for perfection but I’m still interested to read about how I can stitch more ergonomically and so on. I doubt I’ll ever count the threads of my fabric etc but I will be interested to see the difference between her technique and the Thimblelady’s. Just look at the beautiful quilting on the back cover! Wow! I can see why you waited to buy the book. It looks interesting. If you get any tips you’re allowed to share, please let us know. The quilting on the back cover is amazing! I found an original book, by DeDe’s mother, Roxanne. THE Roxanne from Roxanne’s Thimbles. I read it cover to cover, her mother was a wonderful gifted writer. As I completed the book, I was so brokenhearted to learn she passed away before the book was out in print. So sad to lose someone of that talent. Her daughter is continuing in her Mother’s shoes. If the new book is half as good as the original one, you’ve got a good book. As you know, I took Didi’s “That Perfect Stitch” hand quilting class. The example on the back cover is the class practice piece. Believe me mine looks nothing like that. “That Perfect Stitch” is the classic rocking method. There’s a short video online in which Didi step by step demonstrates the movements–http://www.how-to-quilt.com/video/didi-handquiltM.mpg. She, & I understand as her mother before her, is an excellent teacher. The thread count of a fabric has a direct impact on hand quilting. What I found of special interest, is that often our lack of success is due to our tools, fabric, & batting choices. Not necessarily our skill. I think you will find the ergonomic comments useful. 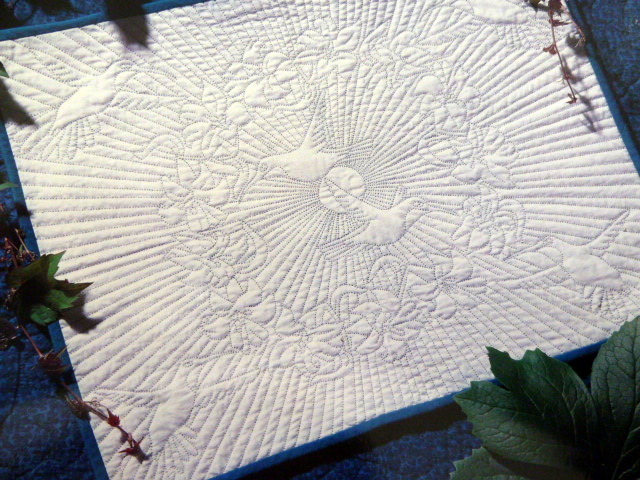 Can you believe that quilting on the cover? I’m a little late responding, as i just got to Florida to visit my mother. I also have Didi’s mother’s book “That Perfect Stitch” and also read it cover to cover. So much information. Really looking forward to the new and updated version. I’m putting it on my Christmas List, that is, if I can wait that long. Like Sylvia, I go hoopless too, but have hopes of quilting in a frame. May be one day. Munaiba, tell us more about your Big Stitch Quilting.